Unlike any man Emma has ever known, Dominic is confident, grounded, and committed to being present for his son whose mother fled shortly after he was born. They become friends, and slowly much more, as Emma finds herself feeling at home in a way she never has before. But just as they start to imagine a life together as a family, fate intervenes in the most shocking of ways. For the first time, Emma has to stay and fight for what she loves, for the truth she has discovered about herself, or risk losing it all. 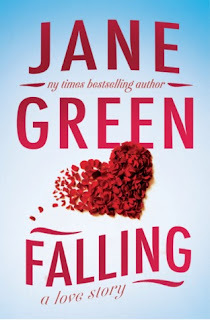 Sometimes I connect completely with the characters in a Jane Green novel and sometimes I just don’t relate very easily. In Falling I found it hard to truly give myself over to Emma. I found her a bit aloof and that was likely because she was trying to find herself also- she indeed came off the pages as unsure of herself. By contrast I was instantly attracted to the town she moves to in New England- immediately visual was the home she rented and the landlord she rents from. I understood how the relationship with Dominic evolved but Emma’s constant questioning was a bit distracting- it seemed to dominate the plot with her back and forth and took away from the natural evolution of their relationship. Yes it was quick but it seemed right if only she’d stopped telling the reader she was unsure. I wish we had had more interaction with her friend Sophie and Sophie’s mother Terry- Emma immersed herself completely in the relationship (as did Jane Green) and left some other plot aspects a little neglected. It actually wasn’t until towards the end of the novel that I truly felt Emma’s emotions from a real place. Her visit to her parents put some things in perspective- it’s too bad we didn’t see that link to her present earlier in the novel. I enjoyed the book, I just didn’t love it. There were characters and aspects I became attached too but it was a bit tricky to love it when I didn’t feel much for Emma herself. However, I will always read the next Jane Green so I have not been put off!